The concrete has strong compressive strength. For this reason, it is very difficult to mash the concrete easily. However, concrete contains comparatively weak tensile strength. So, the concrete can be easily cracked against bending or twisting. Reinforcing bar alias rebar is used to enhance the tensile strength of concrete. Usually, there are only six common types of rebar with different rebar lengths and diameters which range from European (a carbon, manganese, silicon, etc. alloy); carbon steel (basic “black” rebar); galvanized; epoxy coated; glass-fiber-reinforced-polymer (GFRP); and stainless steel. The different types of rebar have unique strengths and weaknesses. 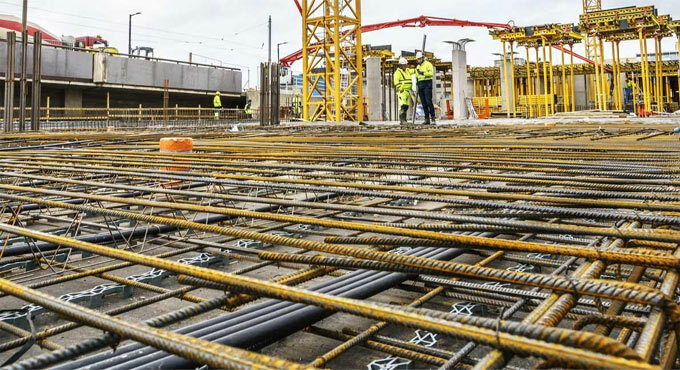 European Rebar: It is very cost-effective. It is formed with manganese. The European rebar has least resistant strength against bending. So, it is usually not suitable for being utilized in areas where earthquakes may occur. Besides, it should not be utilized for projects that need strong structural integrity from its rebar. Carbon Steel Rebar: It is mostly used. In this type of rebar “black” bar is employed on each type and scale of project with few exemptions. The main issue with black rebar is that it rusts easily. When rebar rusts, the concrete will be broken around it due to expansion. Under the situations where the rebar is uncovered to humidity or water saturation, the black rebar should not be utilized. Based on its value/tensile strength ratio, black rebar is a good choice. Epoxy-Coated Rebar: Black rebar containing an epoxy coat is called as epoxy-coated rebar. It contains the similar textile strength, but comes with 70 to 1,700 times more resistant capacity to rust. The epoxy coating is extremely delicate. The resistance strength of this rebar will be decreased with the significant damage to the coating. Galvanized Rebar: Galvanized rebar has forty times more resistant capacity against corrosion as compared to black rebar, but it is not easy to damage the coating of galvanized rebar. So, it is more useful as compared to epoxy-coated rebar. However, it is about 40% more costly as compared to epoxy-coated rebar. Glass-Fiber-Reinforced-Polymer (GFRP): GFRP belongs to composite much like carbon fiber. Consequently, field bends are not allowed when GFRP is applied. However, it will not rust in due course of time. In this regard, GFRP is an unparalleled concrete reinforcement bar. It costs ten times as much as epoxy coated rebar per pound, it is exceptionally light, so the cost becomes double while considering linear feet. Stainless Steel Rebar: Stainless steel rebar is very costly, about eight times the cost of epoxy-coated rebar. It is also mostly utilized for most projects. Most stainless steel rebar has 1,500 times more resistant capacity against corrosion as compared to black bar. Besides, it has also good resistant strength to damage as compared to any of the other corrosive-resistant or corrosive-proof types or rebar; and it can be easily bent in the construction site.